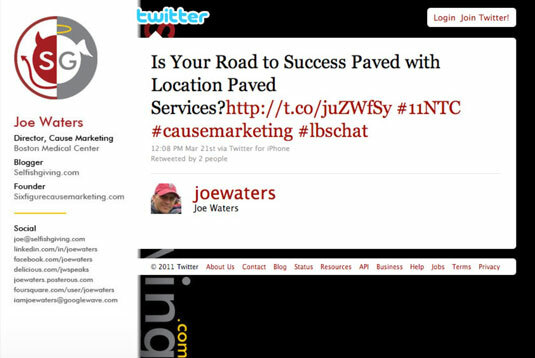 When tweeting about cause marketing, you can use the hashtag #causemarketing so that other twitterers, including those that may not follow him on Twitter, can easily find tweets of common interest. You’re probably familiar with Twitter, the microblogging platform that lets you send messages, or tweets, of up to 140 characters to followers. What you may not know is what the pound (#) sign means when it comes before a word(s) on Twitter (for example, #fundraising). These #’s are called hashtags, which are kind of like bookmarks that allow people to easily find tweets around a particular issue or topic. A hashtag allows others to find tweets on a specific topic, #causemarketing. You can search for a hashtag in many ways, but one of the easiest methods is to type it in to Twitter search (Search Twitter) and view the results. 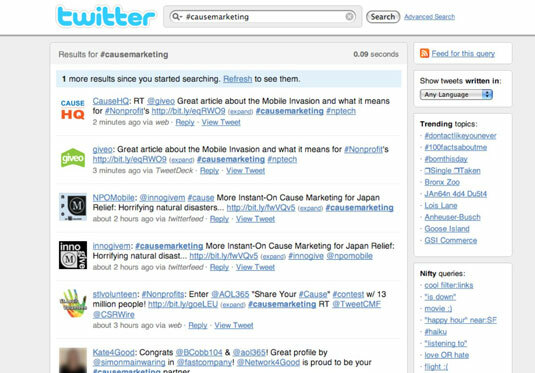 Twitter search results when you search using a hashtag: #causemarketing. A cause and company work on a campaign, and the company agrees to donate a certain dollar amount for each tweet that contains the agreed on hashtag. The amount can be $.05, $.10, $1, $5, and so on. Often, a company will agree to donate up to a certain amount — for example, $1,000 or $5,000. It’s important to clarify this amount right in the beginning. The partners need to agree on one hashtag that will be used for the duration of the campaign. A consistent hashtag is important for branding and tracking how much is raised. Both partners need to promote the hashtag fundraiser through every promotional vehicle they have, but especially through social media (blogs, Facebook, Foursquare, and so on). People who use Twitter tend to be active social media users, so engaging them on other platforms can be very effective. At the end of the program, add up the number of hashtag mentions and collect your donation from the company. Also, don’t forget to include and share all the great exposure you got out of the program! One of the most successful hashtag fundraisers is #beatcancer, a partnership between PayPal and SWAGG.com to raise money for cancer charities, such as Stand Up to Cancer and Lance Armstrong Foundation. Since 2009, #beatcancer has raised nearly $100,000. 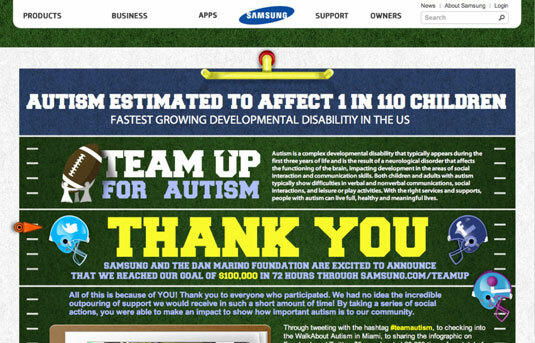 Another successful hashtag program is #teamautism from Samsung in cooperation with the Dan Marino Foundation. Samsung agreed to donate $5 each time #teamautism was used. This donation, combined with other efforts, raised $100,000 in just 72 hours. Samsung and the Dan Marino Foundation’s #teamautism helped raise $100,000 in three days.